What is hysteresis? Is it important for your application? What effects could it have? Generally speaking, hysteresis is a lag in reaction to a force. It can be found everywhere—from physics and engineering to biology, chemistry, and even economics. In this article, we explain the fundamentals and complexities as we explore how hysteresis affects the proportional control of fluids. To understand hysteresis in some of its more complex states, it helps to first look at it in some of its simplest forms. Frictional hysteresis is relatively easy to understand because we can see—and sometimes feel—the results. Mechanical hysteresis is often referred to as "play" or "slop." Think about a single knob water fixture that you turn clockwise to turn the water on. With this knob, you know that if you turn it directly to the 12 o'clock position without going too far, you get perfect water flow. However, this is an older faucet with a little "play" in the handle. If you go past 12 o'clock, you end up needing to turn back to 11 o'clock to get that same perfect water flow. As you turn the faucet back, the "play" you are experiencing is a lag. This is an example of hysteresis. 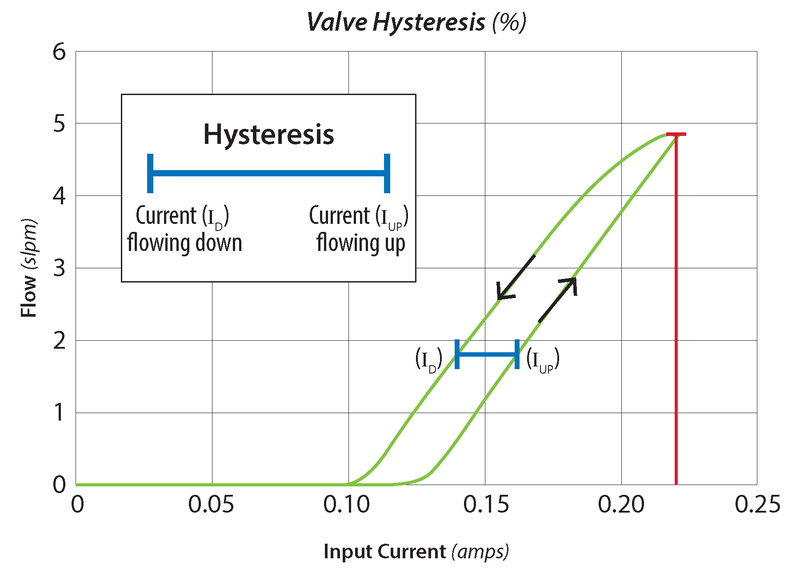 As it relates to proportional valves, hysteresis is the difference you see in flow when you go directly to a particular point, compared to when you go past that flow point and try to return back to it. For example, consider a standard current driven proportional valve with a nominal hysteresis of 10%. If we apply 0.15 amps to achieve 1.0 L/min, then turn the current up to 0.2 amps for more flow, a nominal hysteresis of 10% means that when we come back down to 1.0 L/min, we would need to be about 10% lower with our supplied current to reach the original flow rate. The hysteresis we see in current driven proportional valves is primarily magnetic. When we supply current to the valve's coil, we are producing an electromagnetic field which forces the poppet to move. It takes a greater force to open the valve than it does to close the valve—it requires more current to open on the uphill side of the flow curve than it requires on the downhill side of the flow curve. Getting to the lowest hysteresis possible is a challenge. When working with solenoid driven valves, many variables such as temperature, wear, and spring rates can affect the magnetic hysteresis. Ultimately, good control can be achieved as long as the valve performance is repeatable. Any valve with consistent performance can greatly reduce hunting—when the system overshoots and undershoots multiple times to get to a point—in closed loop systems. The lowest hysteresis proportional valve Clippard offers is the SCPV series stepper-controlled proportional valve. This valve is driven by a miniature stepper motor which has zero magnetic hysteresis and a mere 2% (nominal) mechanical hysteresis. This is the result of small amounts of "play" in the actuator. Think of a basic needle valve that you would adjust with your fingers, then put a stepper motor on top. Clippard's SCPV stepper-controlled proportional valves have become very popular in systems without feedback, because they can be commanded to a predetermined step to achieve repeatable performance.